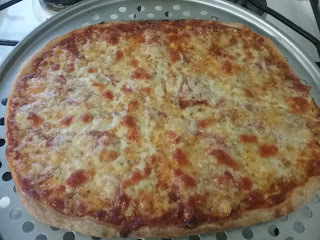 Last night I made a Salami Pizza using my new pizza pan. Because of the perforated pan I think the pizza cooked more evenly and the bottom crust was perfectly browned. 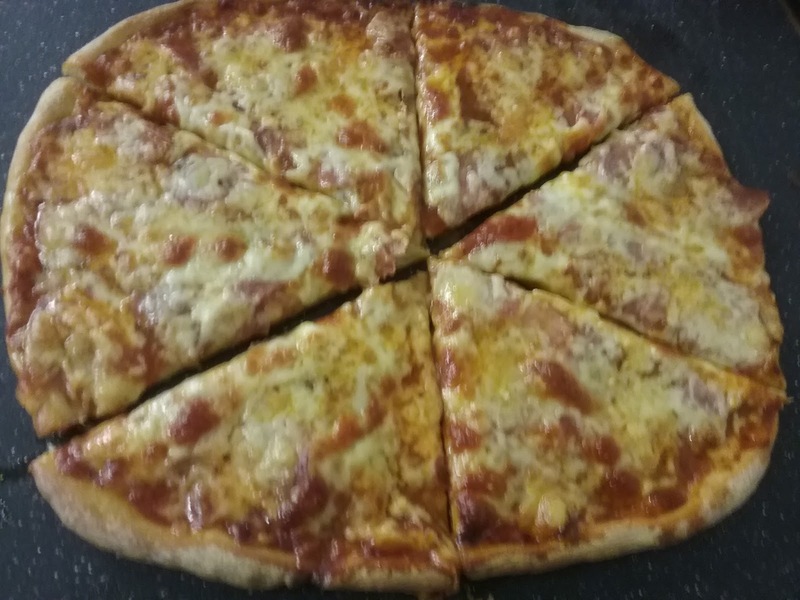 I had made this pizza dough a few weeks ago and froze 2 of the 3 portions. 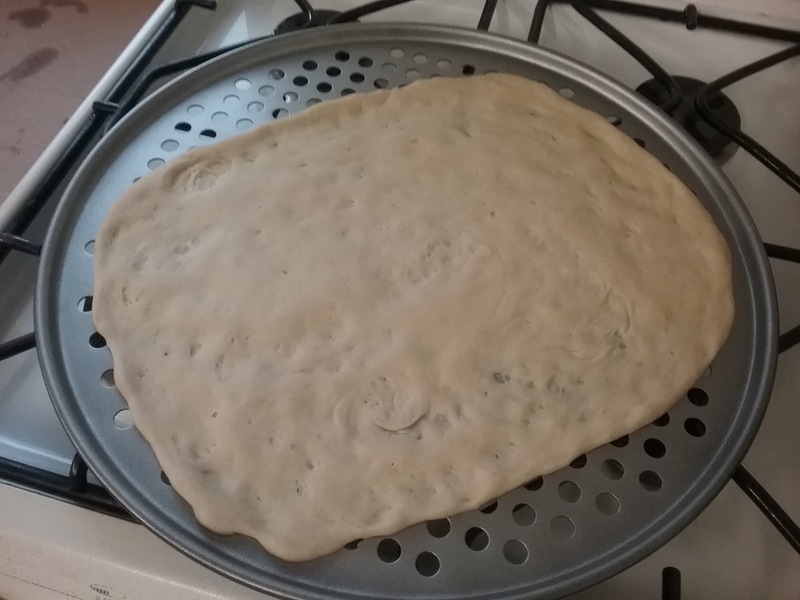 The dough did not rise as much after being frozen, but was still delicious and made a beautifully thin crusted pizza. 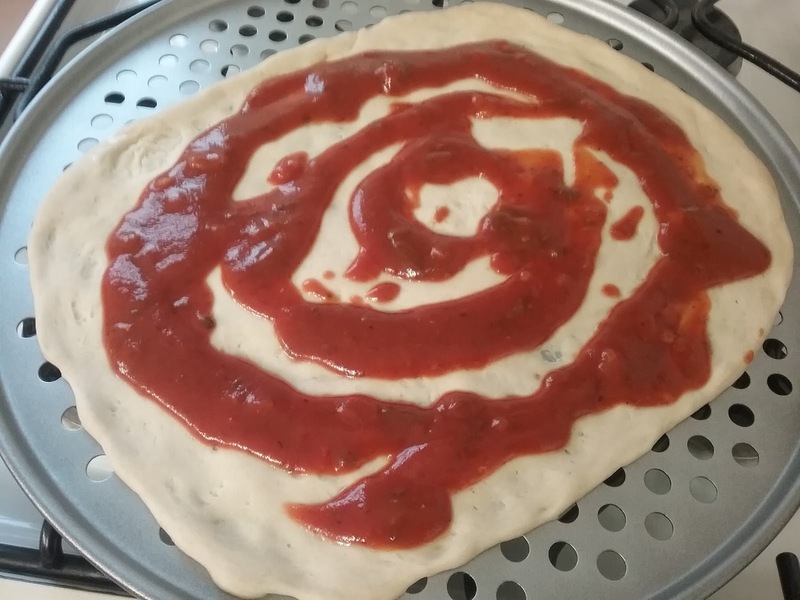 A few days ago I made a really rich tomato sauce so putting this pizza together was fast and easy. Of course you can use sauce in a jar, but it is more fun and much better to make your own! Recipe for the dough is from Giada De Laurentis. I love most of her recipes and this one is no exception. Put the water in a small bowl. Add the yeast and stir until dissolved. In a large bowl, whisk the flour and salt together. Add the yeast mixture and stir until a soft dough forms. If the dough is too dry, add a little more water, 1 Tbsp. at a time. If the dough is too sticky, add more flour, also 1 Tbsp. at a time. Transfer the dough to a floured work surface. With floured hands, knead the dough until it becomes smooth and elastic, about 10-12 minutes. That is a lot of kneading, but I believe that is why this dough is so tender and yummy. Drizzle the inside of a clean bowl with olive oil. Put the dough in the bowl, roll it around to coat with oil. Cover loosely with plastic wrap or kitchen towel. Set the bowl in a warm, draft-free place (not easy in Ireland! ), until the dough has doubled in size; about 2 hours. Using a fist, punch down the dough in the center and cut it into 3 equal-sized pieces. Form the dough pieces into 3 balls and put in oiled bowls. Cover each bowl loosely and let rest for another hour. 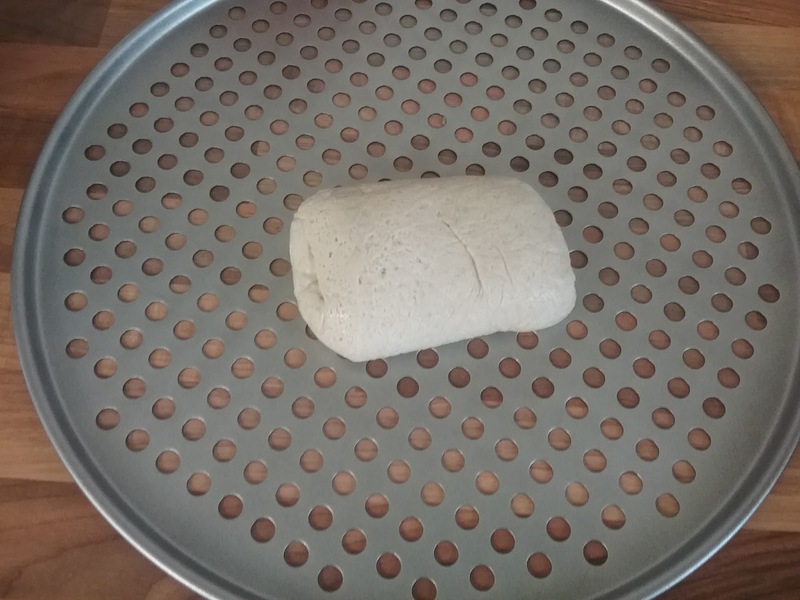 Remove the dough and wrap in plastic. Refrigerate up to 1 day, or freeze as I did for a couple weeks, or use straight away. Using your fingers gently spread the dough out on a pizza pan or cookie sheet. As you can see my dough did not quite reach the edges of the pan, but that is no problem. Drizzle with red sauce and then add whatever toppings you like. 68% of Americans prefer meat toppings and pepperoni is the most popular choice, but experiment with different veg: eggplant, roasted red pepper, cauliflower. I topped with Salami Milano and Coppa Salami, freshly grated Parmesan and Mozzarella cheeses. Salami Milano is a cured sausage consisting of fermented air-dried pork or beef. I used pork. Coppa or Capocolla is a traditional Italian and Corsican sausage made from the dry-cured muscle running from the neck to the pig shoulder. 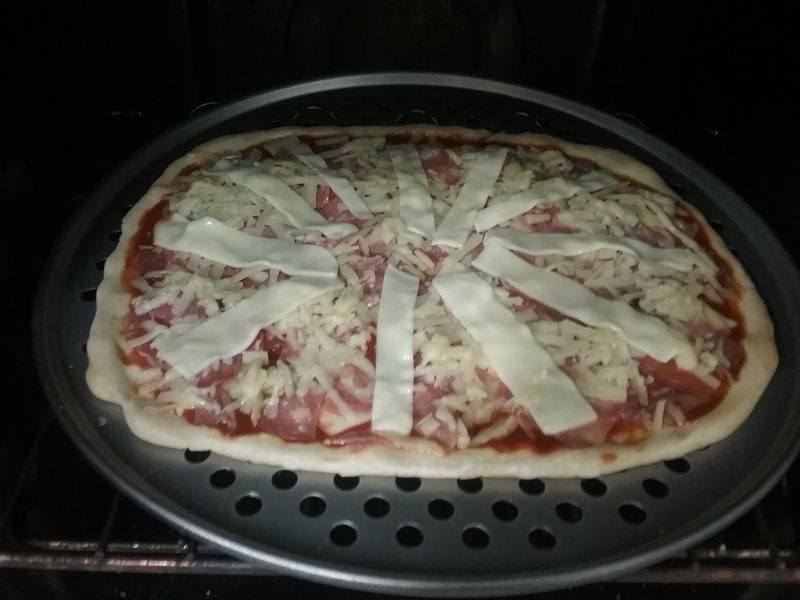 To cook your pizza pie, preheat oven to 375 degrees. Cook for about 20 minutes depending on your preference of crispy or doughy crust. Let rest a couple minutes, then slice, and EAT! 46 slices of pizza per year. 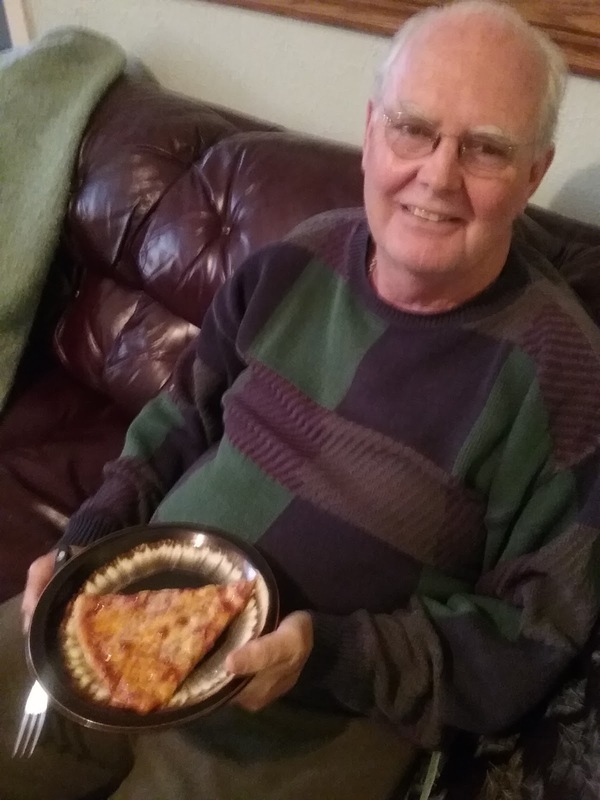 My husband, Jerry, loves pizza! That's all for today. We are leaving Ireland in less than 2 weeks returning to the land of sun and warmth in beautiful Arizona. This year has been a challenge cooking in Spiddal, Co. Galway, Ireland as we are doing renovations on our house and I have had no kitchen for the last 3 1/2 months. 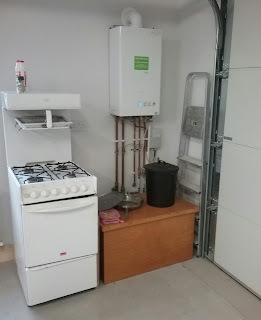 I am cooking on our old stove which has been set up in the garage. Not the most convenient, but a fun challenge!